Sometimes people who are not in the know of French wines, and more especially Bordeaux and its classification, seems to mistake 2nd growth with the 2nd wine or 2nd label, confuse them or misunderstand the concept of them. That was the case for one of my colleagues at work who enjoys wine from time to time but seems to have little knowledge when it comes to history and/or classification of Bordeaux wines. His question, that I answered as simply as I could, inspired me to write this post for whoever will be interested to know about the differences. The term "Classified Growths" (or "Crus Classés" in French), usually refers to Bordeaux Wines and basically represents the listed Chateaux included in the original "1855 Bordeaux Classification", as well as the Chateaux resulting from property splits due to new ownership or family matters. 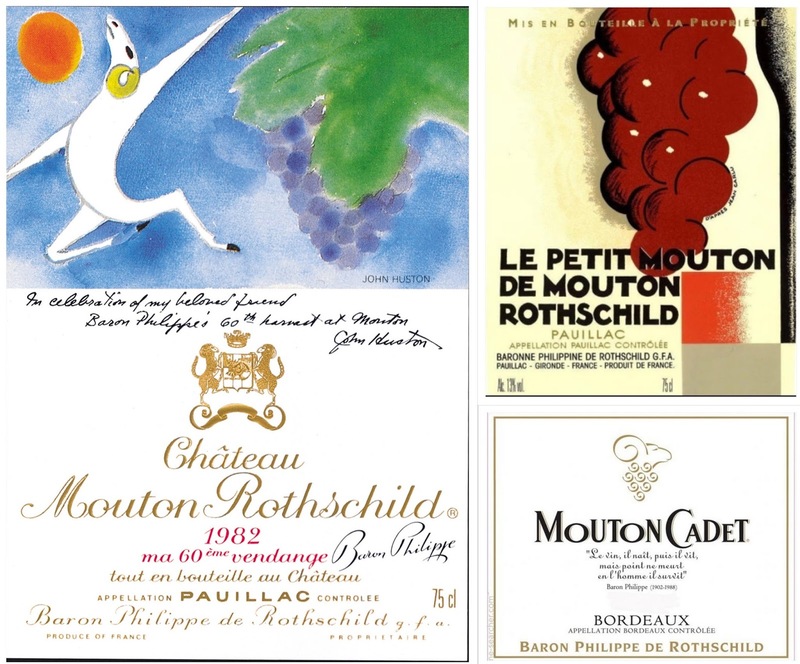 56 Châteaux from the "Haut-Médoc"
1 Château from the "Graves"
FYI: Despite Château Lafite-Rothschild, 3 of the original 4 "First Classified Growths" bear the name of "Premier Grand Cru Classé" on their label. Some of the 2nd, 3rd, 4th and 5th growths also bear "Grand Cru Classé en 1855" on their label. (*) Château Mouton-Rothschild was a 2nd Growth in 1855 and was only elevated to the rank of 1st Growth in 1973, yet most listing I found include it in the 1st Growth of 1855, which is wrong and makes me wonder why people do not check prior publishing such incorrect lists on the internet. 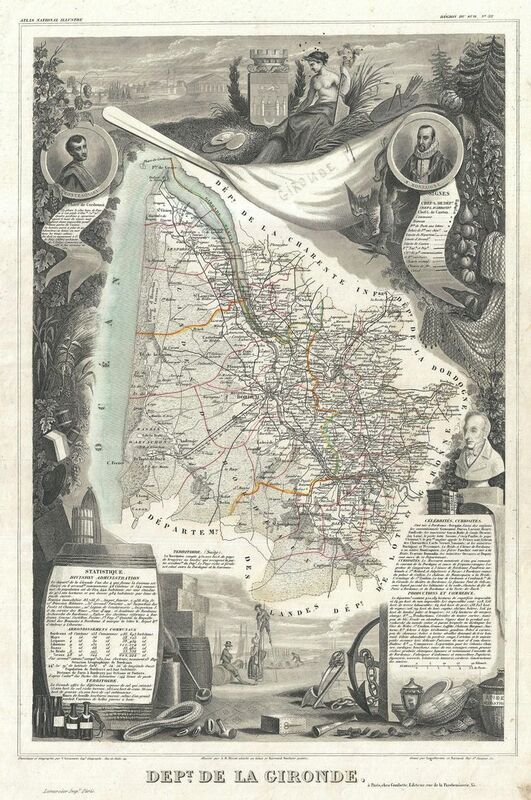 (**) Château Cantemerle was apparently not listed on the 1855 list. It appears that it was added to the Classification List the year after in 1856. Was it forgotten or omitted from the original list then added later? Who knows really? 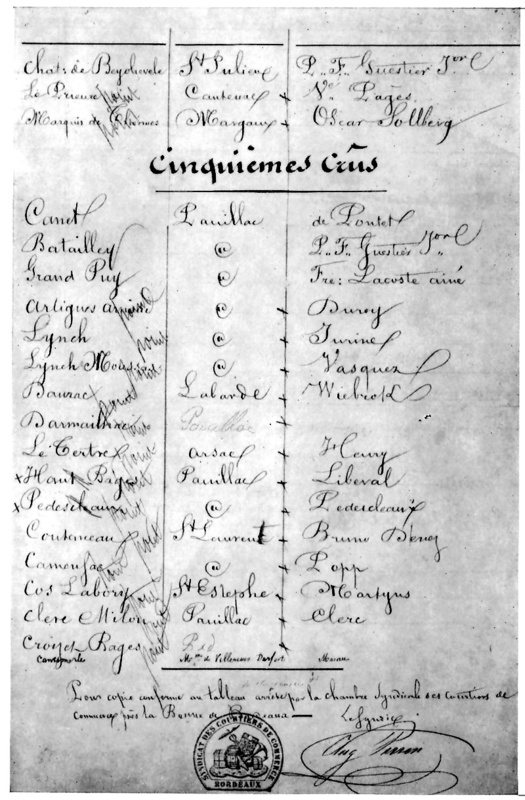 What we know is that some writings on the subject are quite controversial and/or contradictory on the fact that whether Cantemerle was part of the original 1855 Classification list or not. 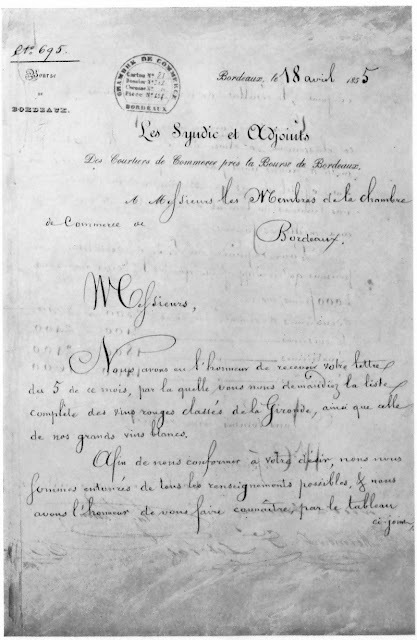 I wrote a little about the 1855 Bordeaux Classification further below in this post just to complement a bit this Classified Growths Chapter. Or from vineyards that do not produce grapes of high quality enough to be included in the production of the "Grand Vin" due to various factors (Terroir: soils, subsoils, inclination, exposition, orientation, climate, environment, etc...). The best parcels are usually reserved to produce the "Grand Vin", lesser or younger parcels to make the 2nd or even 3rd wine. 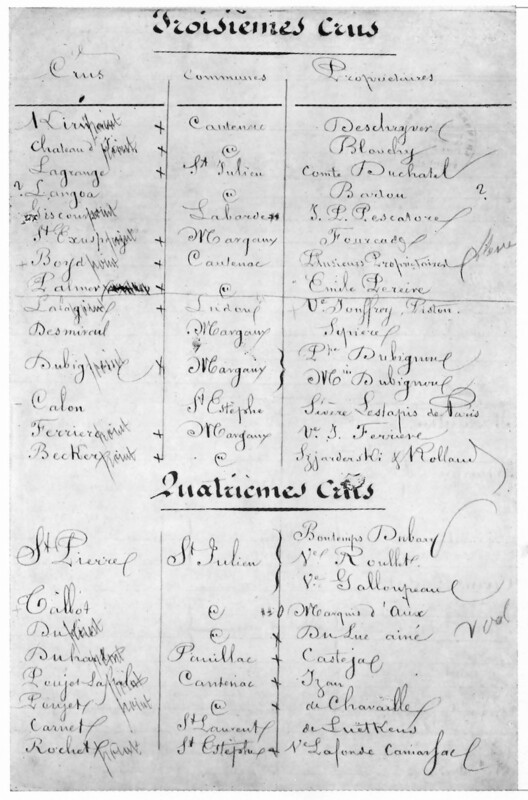 And now, to complement a little bit the Classified Growths Chapter above, let's talk about the 1855 Bordeaux Classification in Photos.. a visual often speak louder than words and too many long articles have already been written on the subject. Back in 1855, Emperor Napoleon III requested from the wine Brokers, Negociants and/or Merchants to create a Classification system of the best Bordeaux wines that were to be on display for visitors at the "Exposition Universelle de Paris". 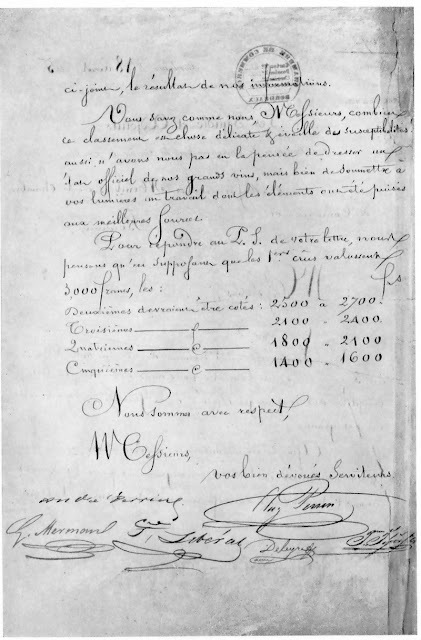 They first established a list of the best Chateaux in Bordeaux based on their reputation and notoriety, then ranked them by adding the Chateau's trading prices, which, at the time, was a reflection of their quality (I said "at the time" because, nowadays, if the Classification had to be redone, people will realize that high price is not always reflecting the quality of the wine and the ranking of these same wines will definitely not be the same.... but that will be the subject of another post). The wines were ranked and sorted by order of importance, notoriety, and price. 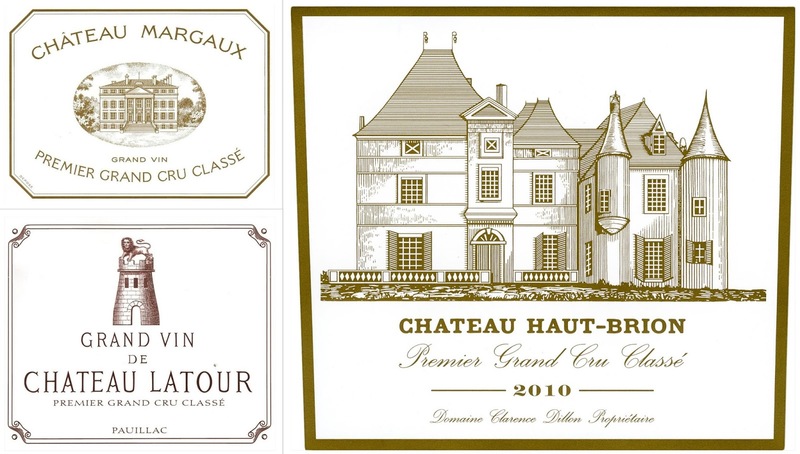 Most Reds came from the Médoc region except for Château Haut-Brion from Graves. 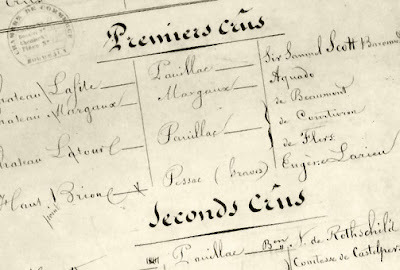 The list was divided into 5 categories: from First to Fifth growths (or "Crus" in French). 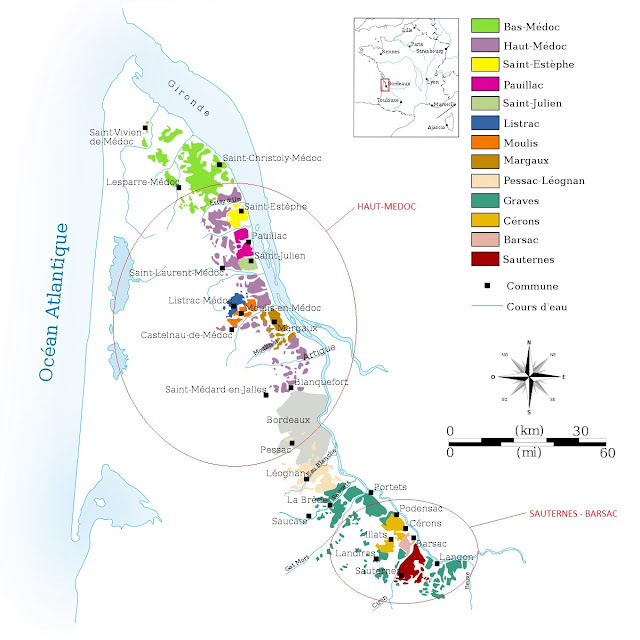 As for the white wines, the classification concerned only the sweet wine of Sauternes and Barsac, which were ranked in 3 categories: Superior First Growth, First Growths, and Second Growths. Classification of French wineries, estates, and vineyards does not solely stop at Bordeaux, other French Regions like Burgundy and Alsace also possesses their own "Grand Crus" and "Premiers Crus". And drink good wines, life is too short to drink bad wines! And do me a favor, stop thinking that good wines are always expensive. There plenty of great wines at very affordable prices out there, just look for them, they exist...!?! Thank you Mark, I'm glad you found my post useful. That is exactly what is keeping me going on writing more of them. Thank you Linda, glad you enjoyed reading it and will try to write more posts like this one. It is people like you who inspire me to continue writing.